There are many ways to integrate social media into organizational communication and any model has a number of variables that would be unique to the organization. However, there is one common denominator. Integration requires thinking different. In developing a working model to integrate social media into a public relations-driven communication plan*, experience has shown that social media tends to be too cumbersome for most public relations departments (and outside firms) to manage it like another bullet item under the laundry list of services adopted as public relations. Sure, it can be done. It just doesn't seem to be done well very often. From our experience, there are several tangible reasons to maintain some separation between the two communication roles as they work in tandem. First and foremost, social media, which mostly consists of two-way direct to public communication, tends to drive public relations away from its core function and world view. The result tends to produce one-way broadcast (spam) communication across social channels, customers being pushed off for lack of "influence," and time management issues related to the ratio of customers/bloggers as opposed to journalists. *We'll cover other industry-driven models in the weeks ahead. The above illustration isn't theoretical. It was applied to a producer-managed theatrical release and build up to the home distribution release of an independent film by Sony. (For the purposes of post, we've removed the management paths which placed our role over five public relations firms while managing all aspects of the social media program). 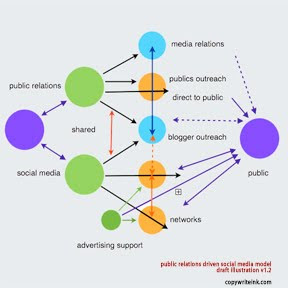 In this model, public relations manages the public relations functions and social media manages social media functions, with some obvious areas for crossover communication. For simplicity, I'll break each team's role down to primary functions and then reinforce some shared functions. • Managing media relations, which includes press releases, interview pitches, and demonstrations. The function is designed to generate increased exposure. It's mostly one-way communication with journalists vetting information, tailoring content to meet the needs of their readers, and writing opinion-editorial pieces. • Public outreach, which includes programs and communication materials for special publics (e.g., associations, special interest groups, unions, etc.) as well as direct to public communication and/or publicity. It's mostly one-way communication, with either group leaders informing members or the public receiving information. • Blogger outreach, which includes either adding popular bloggers within the media relations mix or working with bloggers who have been referred by the social media team because they have special needs that are similar to journalists (such as requesting specific interviews, etc.). • Maintain, manage, and promote the organization's blog. This may include market intelligence (which is shared with the public relations team), but primarily consists of content development and content distribution that adds value for customers. While blogs are presentation oriented, they do provide for two-way communication. • Maintain, manage, and develop the organization's social networks. This includes online programs and information sharing that nurtures true engagement and two-way communication in real time. It may also include identifying forums beyond popular social networks where people ask questions that need to be answered. And, in this model, we allowed for advertising support specifically designed to drive customers toward networks where they can be engaged. • Blogger outreach occurs directly and indirectly as bloggers may source content from the organization's blog or develop relationships with the social media team via any number of social networks. The benefit for the public relations team is that a social media team can determine which bloggers have information requests or require support more like a journalist. • Blogger outreach, as mentioned above, works best with a public relations driven communication plan when the function is shared by public relations and social media. In effect, this approach allows the social media team to meet the daily needs (and recognition) of bloggers while referring bloggers with special needs (such as an interview request) to the public relations team. • Since social media is its own environment, communication tends to be fluid. Journalists don't alway find stories via press releases or pitches. Story ideas and angles might develop from reading industry blogs, reading the organization's blog, or because most journalists are also members of various social networks. • Research is also a shared function of both teams. While public relations has an obligation to track and analyze trends within specific markets, publics, or industries, social media professionals also track and analyze trends and sentiment via networks, blogs, and search engines. In summation, this model represents an approach to communication that allows for a series of direct and indirect one-way and two-way communication streams and engagement opportunities. The end result of an integrated strategy, assuming the communication is consistent, allows for a message to reach the public from multiple sources, provide multiple opportunities to verify or validate that message, and encourages direct engagement for the long term. This is a much more powerful approach than traditional public relations models, especially in regard to media relations. Traditionally, companies relied on their brand, the reputation/relationship of their public relations firm, and the objective or biased reporting of a journalist to reach the public. If mistrust occurred at any point in this linear stream, the organization could be damaged for the life of the story or, in some cases, permanently. I might add that there is a reason I did not add clear management paths to the model. The reason is simple. Social media fits differently for different companies. In this model, social media could maintain its own autonomous distinction, report to marketing, public relations (provided public relations affords the social media team some autonomy as the functions are largely different), or a more complicated model such as the one we worked on last year. Rich - as always, thoughtful post. Being in a PR firm, I do have to disagree with the crux. In my opinion, we PR folks used to (traditionally) depend on a via media to reach end consumers of our clients - print media, TV folks, events, brand ambassadors etc. That is now changing - we're offering to our clients the opportunity to create a channel of communication directly with their customers, without any intervening middlemen - sort of a disintermediation of mainstream media. Most PR companies are doing this with varying degrees of success, understanding and evolution. And since we've made the flight from mainstream to direct customers' communication, we've learnt (learning...fast) to get into a conversational mode too, as against the one-way broadcast that worked with middlemen. If this doesn't sound like a blatant linkbait, here's more of this line of thought - had blogged about it last year. I really appreciate your contribution. It's important. Likewise, direct-to-public public relations certainly can also be employed to reach publics on the net, and in looking at the model, I suppose I could have made that more clear. But that is part of thinking different. It doesn't really matter whether a specific public is online or off. A thoughtful firm would want to reach a specific public in whatever way is most beneficial to organization and convenient for the public; whether that means an online forum or town hall meeting really doesn't make much difference. Where your post concerns me, however, is that it introduces another direction (among several directions) that public relations firms are headed. In a sense, such a direction transforms public relations professionals into a group of quasi-celebrity spokespeople as opposed to representatives. It seems to me that such a direction transforms a public relations firm to something else entirely, creating a dual purpose and perhaps a conflict: publicly representing the the individual and the firm as much as it is publicly representing the client. What's so different? I suspect a quasi-celebrity spokesperson is charged with "strengthening the relationships between themselves and various publics for the benefit of the firm and the organization." That is a very different objective with some potentially disastrous consequences, especially for organizations that public relations professionals represent. It's a great subject. Something worth writing about beyond a comment, I think. On the former, it is about PR pros assuming a new role, of quasi-celebs online and promote clients, with or without conviction, much like a paid celeb. brand ambassador. Right...wrong...just a job? Clients will be adequately promoted depending on how creative the PR folks are in delivering the promotional material online, how convinced they themselves sound and how much alleged-influence they seem to have online. On the latter, the lines are not drawn yet, with people like Scott Monty getting the initial flak for promoting Ford, under his personal profiles online. Would this be akin to a brand hiring a celeb. brand ambassador for themselves - it is done in the assumption that the said-celeb brand ambassador has a network online that is highly relevant and receptive to him/ her - and that it may benefit the brand as well as the celeb. PR pro. A symbiotic relationship, if you may call it that. Both are dramatic evolutions from the current models we see and are perhaps forced by the rise of micro-influencers, with strong voices online. An since the rules have not been drawn, it is upto every individual and brand to set rules based on what works for each. It seems Scott Monty is doing a great job for Ford. We might note, however, he is not a public relations pro but a corporate communications pro, which is one department I've always considered well-suited for social media management. In fact, in reviewing Ford's social media and public relations functions, I suspect it doesn't look all that different from what is proposed here, with excerption to the idea that social media is being managed by corporate communications. You defined this as PR pros assuming a new role, of quasi-celebs online and promote clients, with or without conviction, much like a paid celeb. brand ambassador. Sure, it's happening, but I don't see this as public relations function per se nor limited to public relations. Basically, anyone can do it inside the company or outside the company. Carls Jr. recently did it. And while I didn't think the "lunch date" idea flew, Kim is an excellent spokesperson for them. Does that make her a public relations pro now? For the sake of the public relations industry, I hope not. You defined this as hiring a celeb. brand ambassador with a symbiotic relationship, with both promoting each other (like Scott Monty). Again, I'm not sure Monty fits this definition, but I suppose he could. He is following a path not all that different from Robert Scoble and Guy Kawasaki in that his personal brand (if we call it that) is propelled by the company's brand. But like Scoble and Kawasaki, his followers will likely go with him (if he should ever leave) and not with the company. So what does the company gain? Not so much, I think, after such a transition. Maybe they'll lose, if the relationship becomes adversarial. This is one of the reasons this entire path doesn't always sit well with me, much like the existing definition of "micro-influencers." 'm not always convinced that they have as much influence as some think (as we've helped make a few overnight) as influence doesn't really belong to individuals as much as short term engagement and ideas (in some cases, ideas they don't even own). Personally, I think the public relations firms of the future might focus more on strengthening relationships between the organization and various publics in ways that ensure the company is not one day held hostage by such symbiotic relationships. That is not to say that any of these paths are wrong or that I'm proposing any rules (by my nature, I'm against any rules). But what I am considering is that maybe companies need to be cautious before they get into the business of building an employee's personal brand, given the longevity of most employees is relatively confined to a few years. Interesting stuff, indeed.